Our commitment to excellence includes hiring the best employees as well as utilizing the best quality equipment. This combination produces the best quality job for our clients. The Bron 595 Horse Power Mulcher changes the game completely when it comes to larger jobs or larger diameter material. 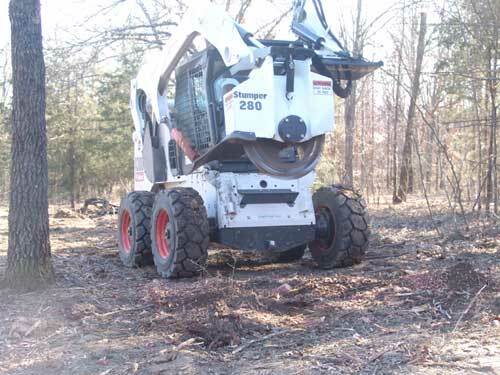 This machine can mulch any size tree, stump, or rootball, and it does the job fast! The mulcher is a smooth drum style that gives the same high quality mulched product that is produced by our smaller mulchers, but this one just doesn't stop for anything! The Bron weighs 55,000 Lbs, but with super width tracks it only puts about 6.5 PSI onto the ground, and the double grouser bars can take this machine just about anywhere, without leaving ruts behind! The Bron 595 can handle large tracts of acreage, big ROW projects, dense cedar overgrowth, or just about any big job you can throw at it. We started Great Views wanting to be able to help private individuals with projects, as well as working commercial and government projects, and we won't ever move away from that model. 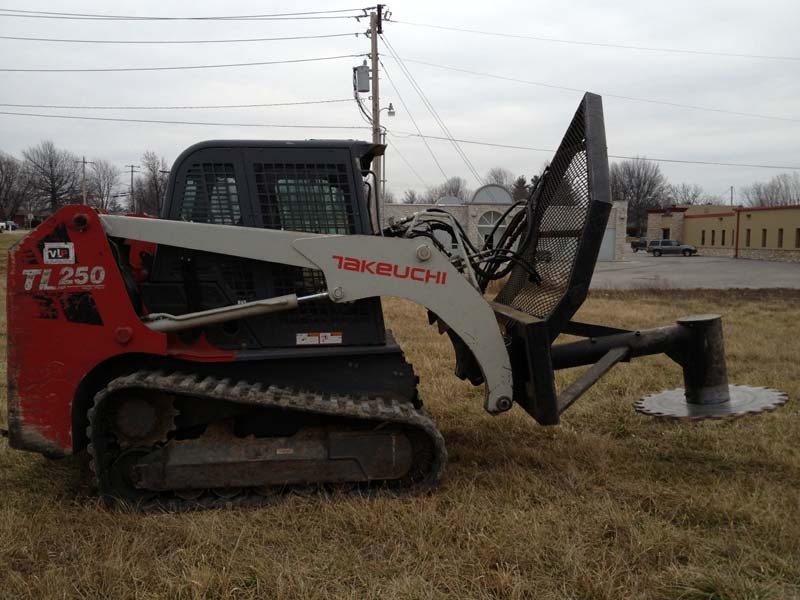 There are times where the smaller Takeuchi machines are more efficient and cost effective. The Bron allows us to also bring an ecomnomy of scale to those projects that were previously too costly to complete with the smaller machines. If you felt like you had challenges just too big to handle, give us a call....The Bron 595 just might be the answer. Check our YouTube and video links to see this 595 Horse Power machine in action! Our Bandit Model 2090 Chipper has allowed us to add chipping service for our clients. This 200 Horse Power whole tree chipper can handle logs up to 20 inches in diameter, and it has a grapple arm for feeding material into the chipper chute. 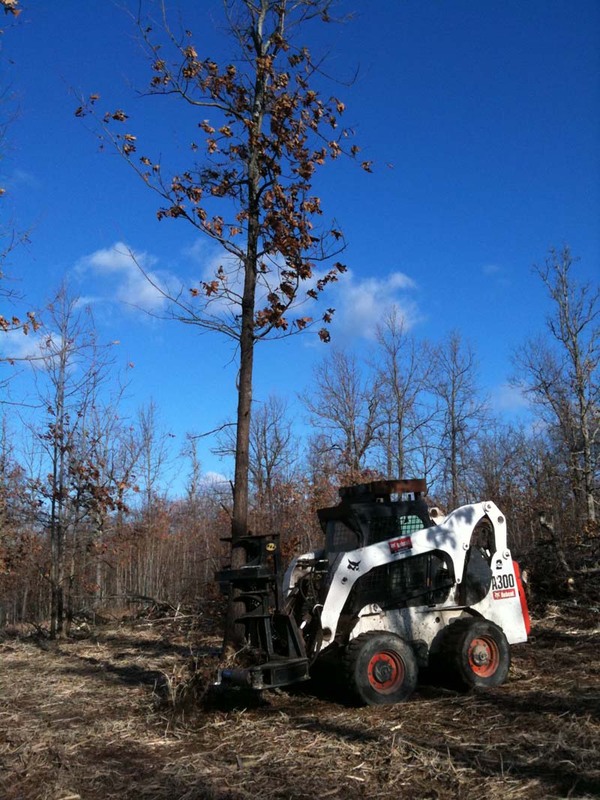 This grapple increases operator safety and efficiency, allowing us to chip trees with maximum productivity. 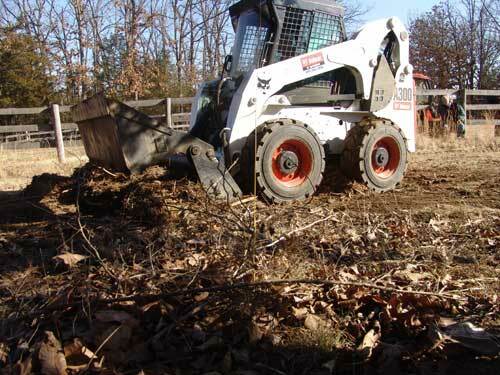 Large brush and tree piles can now be turned into a useful chip product, great for landscaping, bedding, or spreading onto thin soil to break down into additional organic matter for moisture retention. You'll definitely want to check out our videos to see this monster at work! Our Takeuchi TL12 dedicated track machines are perfect for any terrain - including wet or muddy conditions, & working on steeper inclines. These machines have incredible power and traction for working in those tough spots where a wheel style machine just can't do the job. 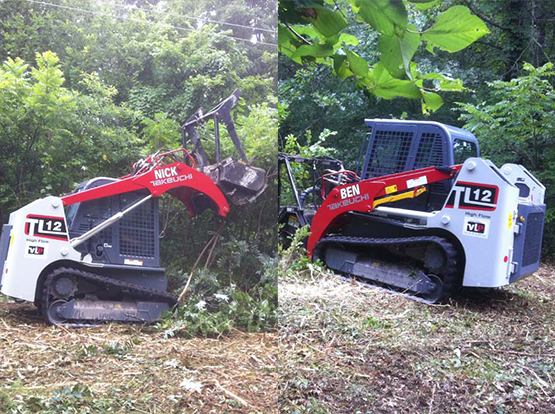 The Takeuchi TL12s have replaced the TL250, the CAT machine and the Bobcat machines seen in some of the images below. These two machines are up to spec on environmental compliance with computerized diesel engines and exhaust particulate filtration. Boasting 108 HP, they get the job done quickly, and leave your ground in good condition. We take operator safety very seriously, and these machines keep our guys safe and comfortable in any weather conditions. We have matched our large two-speed, high-flow loader style machines to attachments that can fully utilize their capabilities. Great Views utilizes two HM312 Mulching Heads that can take down and grind up anything from weeds to 6 inch diameter trees. These "grinders" leave the root system intact, helping to prevent erosion, while grinding up what is above ground into a mulch-like material. 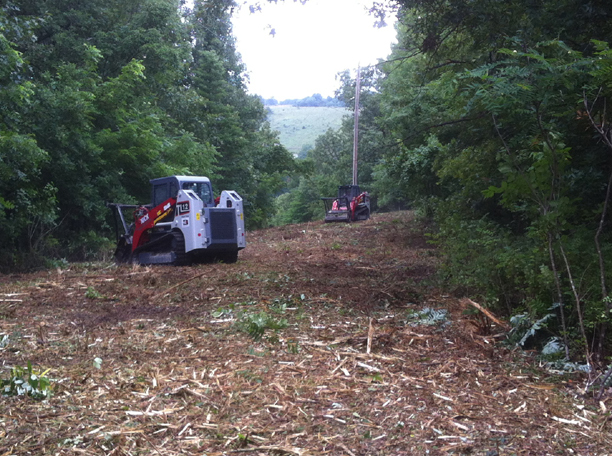 This method of brush clearing is more friendly to the environment than dozing, and provides a 1-step process for quickly removing undesirable vegetation. If you have heard the myth about mulching "sterilizing" the soil, see the note about mulching at the bottom of the page. The Harleman Ground Force Tree Saw can cut off trees from an inch in diameter to over 2 feet! The 42 inch blade on this saw allows us to cut off large trees perfectly flush with the ground, so future mowing or discing operations have nothing to hang-up on. This saw is extremely productive, and it can be used to do a clear & stack operation very economically. When used in combination with the Bandit 2090 chipper, brush and tree piles can be turned into piles of usable wood chips. The blade also turns vertically to help cut material to a manageable size. Harleman has done it again with this attachment, and in our opinion they produce some of the best quality attachments there are - and the good folks there in Eldorado Springs, MO stand behind their products like few other manufacturers. Kudos to these guys! 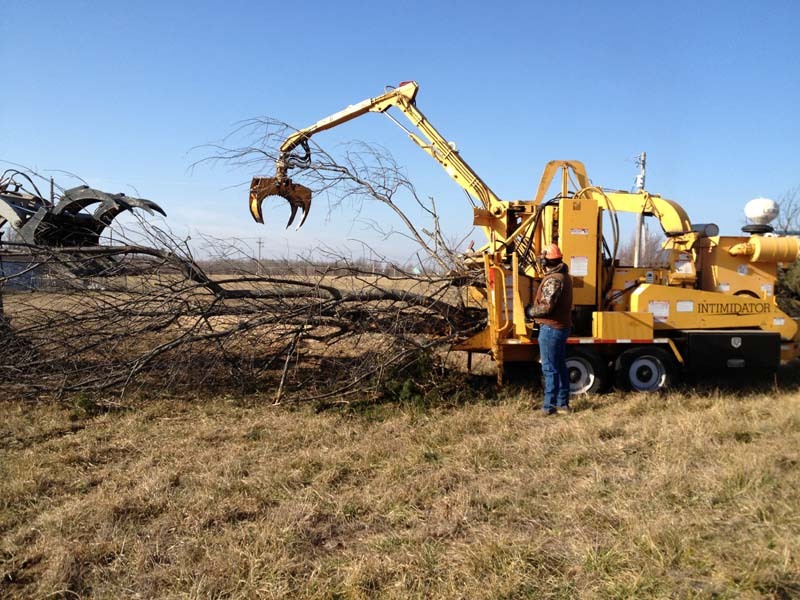 The 16" Capacity Hydra-Clip Tree Shear made by M&M Engineered Products cuts flush with the ground and also has an integral grapple that allows us to selectively remove trees and carry them to collection piles. This not only saves time, but also can help reduce the spread of tire puncturing thorns when clearing larger locust trees by carrying the trees to the burn piles instead of dragging them. The grapple also helps us maneuver the tree while bringing it down to the ground, thereby reducing damage to any desirable trees remaining in the surrounding area. We believe this to be the absolute best shear on the market and the manufacturer takes wonderful care of their customers. 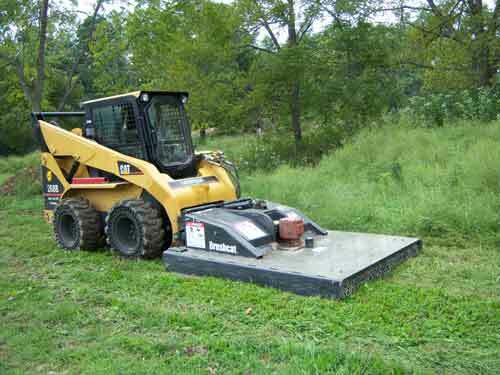 The BrushCat Rotary Mower can "bush-hog" along fence lines, in open fields, or in woodlots. This heavy duty mower has the capacity to cut brush up to 2 inches in diameter just like we were mowing the lawn. This is the tool for that thick multiflora rose, or the briar patch. The 72 inch width and up front mounting allows for maneuvering between and around trees, making woodlot mowing a practical reality. The Stumper 280 High Flow Stump Grinder can grind out a 12 inch stump in just minutes. It is simply a beast. 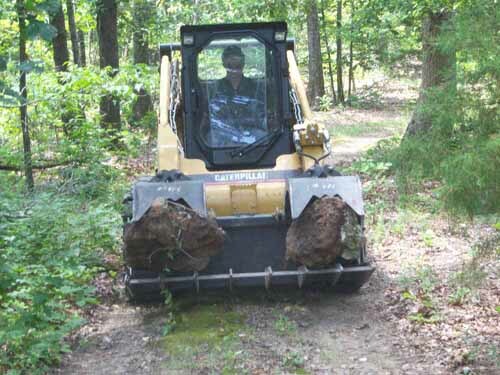 This stump grinder runs on the front of the machines in High Flow mode, and can go from stump to stump with no set-up time. If you have a lot of field stumps, this attachment can make your future mowing days a lot easier. The Grapple/Rake makes brush pickup fast and economical. Whether collecting those ice storm branches that remain at your field edges, or moving large rocks and small boulders to provide landscaping focal points in the yard, this grapple can help make the labor quicker and easier. 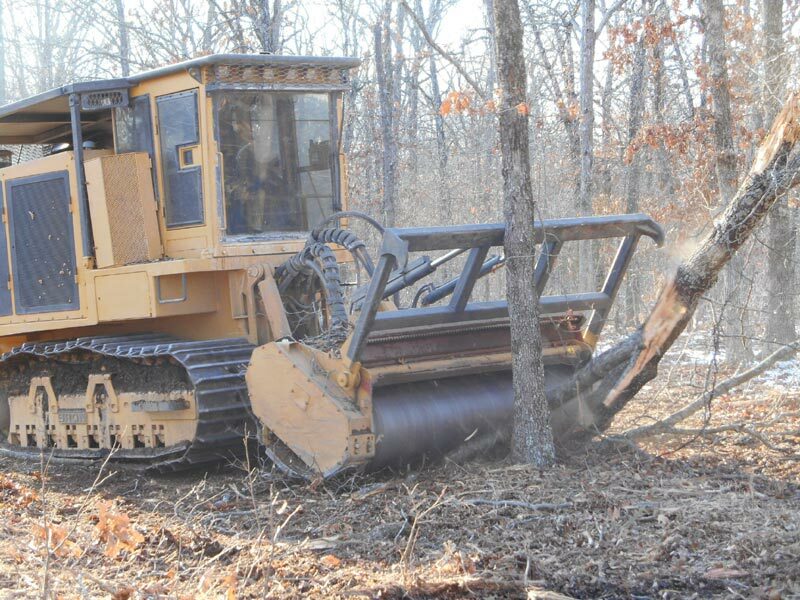 With over 3000Lbs of clamping force, large piles of brush can be picked up and carried to burn piles, where the machine compacts the debris into a tight pile that burns more completely. We have used this grapple more than any other attachment at our own place, and it has been a major force in our cleanup efforts from the January 2007 ice storms. The Combination Bucket provides a useful tool for road and dirt work. 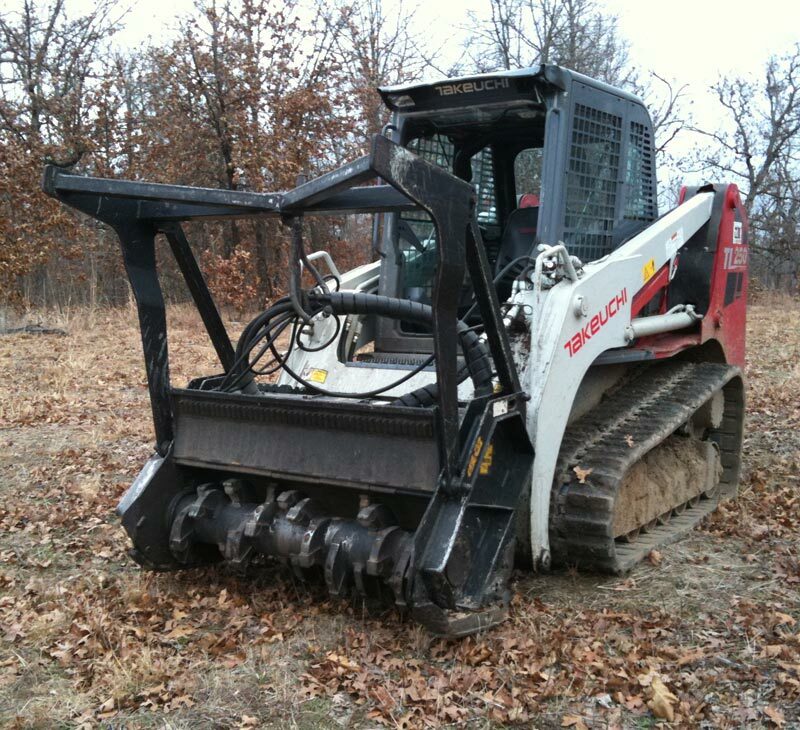 Our business specialty is brush clearing, not earth work. 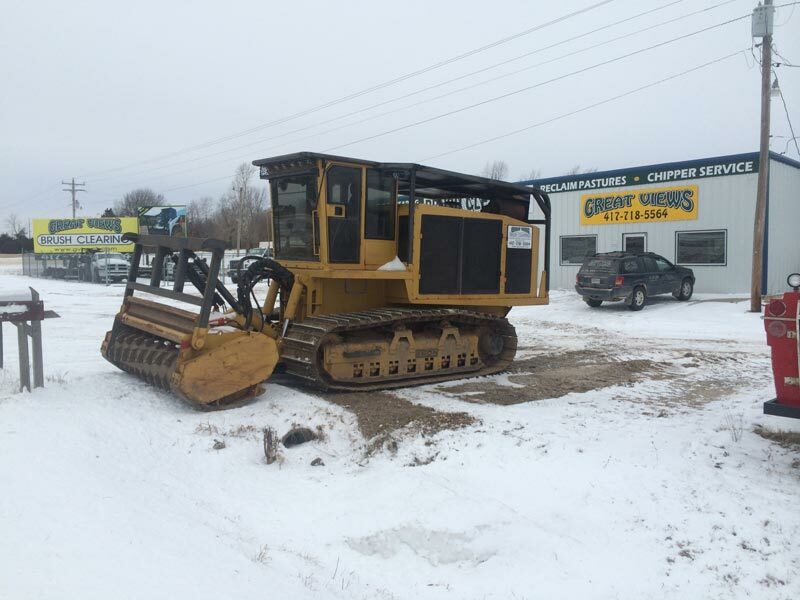 Occasionally though, a client has a need for us to do some road grading or dirt moving and we can help with this attachment. The combination bucket works like any other dirt bucket, but it has a flip up front end that also allows it to be used as a dozer blade, a dump bucket, a grapple, or any one of several other uses. If you need that pile of chat spread out on the driveway, we can help. There is a myth going around that mulching "sterilizes the soil". Our years of experience show that this is not true at all, and the folks that spread this rumor seem to be the ones who do not want to invest the amount of money needed to purchase the proper equipment for the job. We go back to revisit job sites on a regular basis, and our customers love the results they get with native grass regrowth or applying seed to the "disturbed" soil immediately after mulching. Mulching leaves the root systems intact in the ground and a layer of mulch on top, both of which help prevent soil erosion. This is very important on our thin-soiled Ozark hillsides. Mulching also breaks up the root crown of hardwood sprouts like oak and hickory trees. Our experience has shown that doing this during the fall and early winter when a hard freeze can affect the damaged root crown reduces sprout-back by as much as 80% over using a rotary mower that cuts sprouts off above the root crown. The myth of soil sterilization could have started from someone applying a layer of "chipped" material that is dense enough to prevent regrowth, or the use of saw dust as mulch. Chips produced by a wood chipper can stop plant regrowth due to their shape and tendency to form a dense layer, but they are very different from the shredded material produced by a blunt toothed drum style mulcher. Sawdust also can prevent regrowth by using up ALL of the nitrogen in the soil as the sawdust decomposes. The fact is that the National Forest Service as well as many state forestry and conservation agencies specify mulching in sensitive areas where the desired native plants have been over-run by invasive species. These agencies have done the testing that proves that mulching provides the perfect solution for invasive species abatement, including Eastern Red Cedar, Bush Honeysuckle, Multiflora Rose and others. Mulching heads and mulching machines cost tens of thousands of dollars, and you can count on it that any company that invests in one has researched the benefits for their customers before spending that kind of money.